When you run a small business, money is often tight and resources are scarce. For those of us with a budding business, we learn how to work with a shoestring budget and create something (fabulous!) out of next to nothing. Small business owners are kind of like magicians, wouldn’t you say? If you’re just getting started or are looking for new ways to increase productivity AND save money, we’ve created a list of top 10 free tools for small businesses. You don’t have to try them all but I guarantee that at least 2 of these tools will transform your business and leave you better for it. It took me a while to get on the Slack train. I had heard so much about it–everyone was using it–but I figured, “eh, this is another passing millennial thing.” How wrong was I! Slack is nothing short of revolutionary. It’s also super easy to use. Imagine this: you’re working on a project and you have a team or group of collaborators. You’re receiving loads of emails, texts, calls–sometimes the whole team is copied in, other times not. Files are floating around, emails are getting longer and the project is getting tougher to organize and manage. This is where Slack comes in. 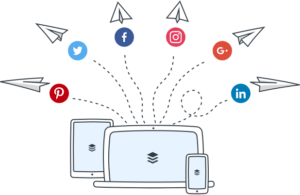 Everything is managed in one place, you can establish various channels to address different topics, share files and integrate your favorite applications. It’s heavenly! I highly recommend it and I use it to communicate with my team every single day. If you use email to communicate with clients then you need Mixmax, period. Mixmax is cloud based software that hooks into your email client. 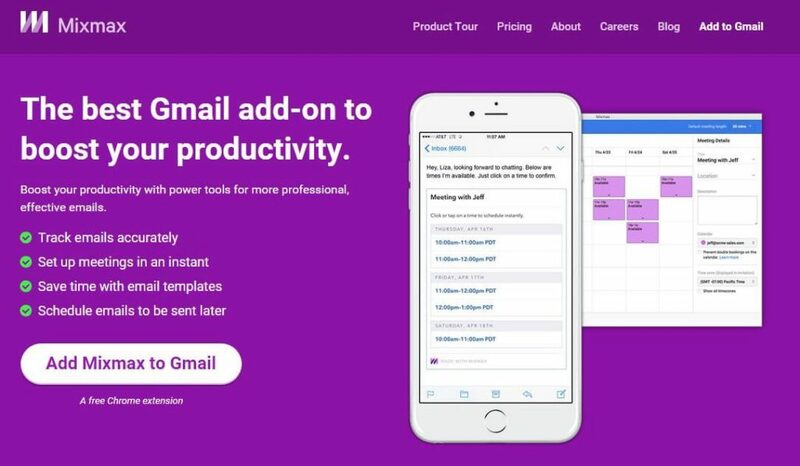 It allows you to see who has opened your emails and when, you can send and book meetings directly from your email, you’re able to schedule emails to go out at a later date, insert pre-written, canned emails and more! For the record, I’ve been using Mixmax for about a year and I am totally hooked. It allows me to gauge clients’ level of interest, work on emails over the weekend without appearing to be working on the weekend (scheduling emails to go out Monday instead of Sunday) and helps to keep me one step ahead of any in-coming projects. If you are on social media (psst: if you run a business you better be on social media! ), it’s essential to have a lock down on ways to create images in a pinch. With Canva, you can do just that! Canva allows you to create compelling graphics for campaigns and posts, with loads of free templates, graphics and stock photos to choose from. Instead of staring at a blank photoshop canvas (silently freaking out) you can simply tweak a professional template to your heart’s content! Since we’re on the topic of social media, let’s talk about scheduling. If there’s one bit of advice that I can instill in new business owners, it’s this: when it comes to social media, consistency is key. You need to be on a schedule and do what you can to get your content in front of potential customers (and be helpful and thoughtful–but I won’t get into that here! But you can read more HERE). In order to get a handle on scheduling, you absolutely need a social scheduler. You don’t have time to log in to your account every day to make a post or 2—that’s crazy making! If you’re just starting out, allow me to introduce you to Buffer. Buffer is a great tool (with a free option!) which allows you to make several posts to all of your accounts in advance. You can determine the frequency and time of day for each social platform, make adjustments on the fly and even re-publish past posts with the click of a button. Such a time saver! Don’t let anyone tell you that email is dead. If you’re sharing thoughtful/valuable content with actionable takeaways (and continue to delight your customers in the process) email newsletters will quickly become your new best friend. An added bonus of sending email newsletters is the ability to see what’s working and what’s not. By utilizing a mail client like Mailchimp, you will get lots of valuable information once the message has been sent. For instance, you’ll be able to see who opened your email, the specific links that they clicked on and who on your list chose to unsubscribe. 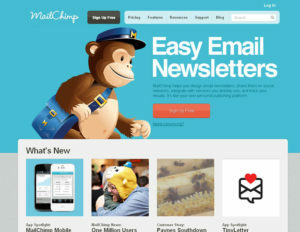 In addition to having access to such valuable info, Mailchimp allows you to build beautiful emails effortlessly, upload lists with the click of a button and continue to grow your email list with website integration. And it’s FREE! 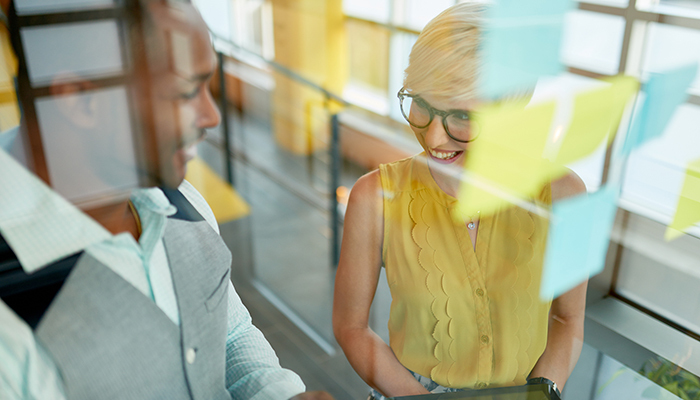 Once your business begins to grow, you may find a need for a solid project management tool. Sure you could share an excel doc and itemize tasks–but does that really make sense? No. No, it doesn’t. Consider giving something like Asana a try. 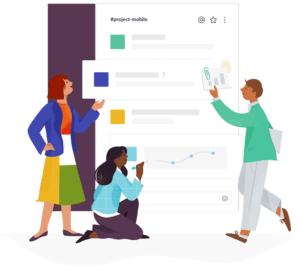 You can create projects, tag various team members for specific tasks, facilitate project-based conversations, integrate the tools you depend on (Google Drive, Dropbox), share a team calendar and even duplicate and reuse popular task lists. 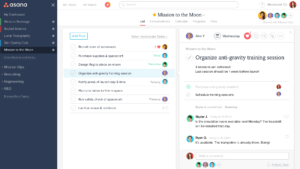 Asana is a wonderful tool and will help you refine your company processes along the way! Thanks to the internet, we now have the capability of working remotely and hire team members from all over the world. For some many of us, if we have a computer and a fast internet connection, we’re in business! This also means that video conferencing and screen sharing is becoming an even larger part of our work flow and day to day interactions. When I meet with my team, chat with clients half way across the world or need to demonstrate something in real time, Zoom is my go to tool of choice. 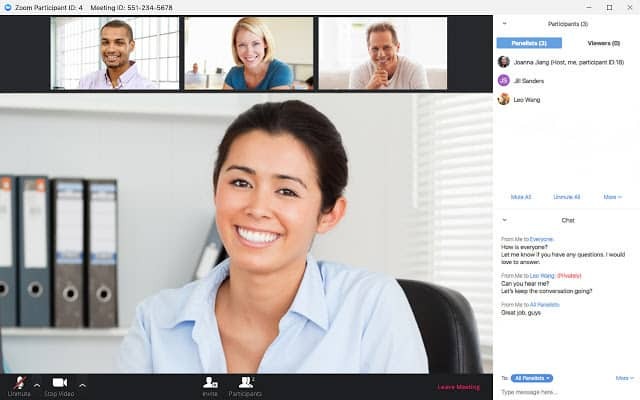 Zoom allows you to share your screen, run webinars for up to 100 panelists (free version) and schedule an unlimited number of meeting for up to 40 minutes at a time (again, free version). You can also record these sessions and even go live on Facebook through Zoom! This is an incredibly powerful, high quality and dependable application. Give it a try! Once your business is in full swing, there’s a good chance you’ll begin to accept payments online for things like your services, products (tangible or digital) and even workshop registrations. If you want to scale your business, allowing for credit card payment is unavoidable. 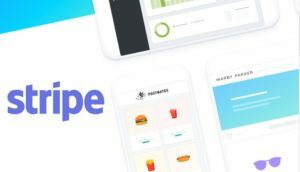 I’ve been using Stripe for about a year now and I love it: it’s easy to set up, integrates beautifully with my website and I am only charged for the payments processed. 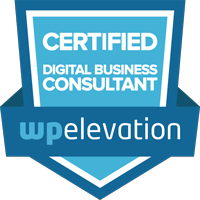 Additionally they have great customer service, it is devoid of setup or storage fees and it allows for easy testing (something I definitely need for the websites we build). All aces from where I stand! 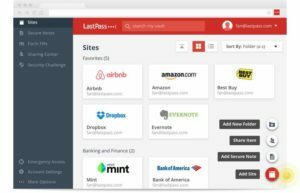 I don’t know where I would be without LastPass. As an agency partnering with lots of different businesses, it’s not unusual to manage 20+ passwords per client. In other words, we deal with a LOT of passwords. Of course keeping all of these in a word doc on our computer is a terrible idea from common sense and security standpoint. Also, who wants to constantly reference and scroll through a document each time you need access to a different set of account credentials? Nobody that’s who. This is where LastPass comes in. These passwords are securely saved to your LastPass account for every initial log in. From there, each set of credentials are automatically filled in each time you hit a log-in screen. You can save and organize your passwords accordingly and, my favorite feature: LastPass can auto-generate super secure passwords for you–which means don’t have to commit them to memory. Yay! If you have a service-based business or are on the cusp of hiring an employee (or 5), then there’s a good chance you have loads of contracts and documents to be signed. 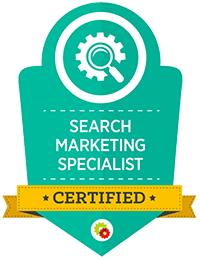 At AlchemyThree, we have a number of contracts and sign-offs that occur throughout the web build, social media management and branding process. 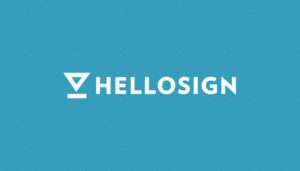 HelloSign is amazing in that we can upload our contracts, identify where the contract needs to be signed, indicate who needs to sign the contract and email it off to the client. We can see when the contract has been opened and we can send reminders if need be. There are also various integrations available as well (Google, Slack, Gmail, Salesforce). It’s awesome and it speeds up (and protects–the contracts are legally binding!) any process you might have in place. So there you have it! Our top 10 dependable, game-changing and FREE tools for small businesses. If you have items from your own toolbox you’d like to share, please do so in the comments–we are always looking for shiny new tools to take for a test drive!